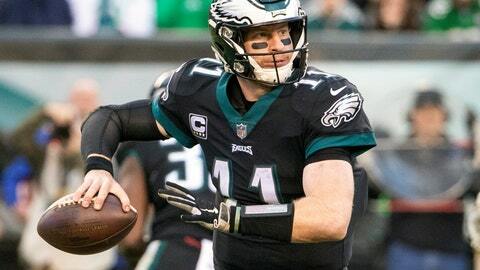 PHILADELPHIA (AP) — Carson Wentz led an offense that steamrolled opponents last season with perhaps less talent surrounding him than he has now. He’s certain the Philadelphia Eagles will regain their production. The defending Super Bowl champions are averaging slightly more than a touchdown less than they scored in 2017, down to 20.9 points per game from 28.6. But the Eagles (5-6) are right in the mix in a mediocre NFC East despite the slide. The Eagles parted with four players on offense after winning their first championship since 1960. Tight end Trey Burton and running back LeGarrette Blount were allowed to sign elsewhere in free agency. Tight end Brent Celek was released and wide receiver Torrey Smith was traded. They were replaced by veteran wideout Mike Wallace, rookie tight end Dallas Goedert, veteran tight end Reggie Rodgers and undrafted rookie running back Josh Adams. Tight end Zach Ertz is having an exceptional season, but wideouts Alshon Jeffery — he missed the first three games — and Nelson Agholor haven’t had similar success. Losing running back Jay Ajayi to a season-ending knee injury in Week 5 hurt the offense, but he wasn’t even part of the team until a trade midway through last season. Wallace only played two games and Rodgers recently came off injured reserve. The Eagles added wideout Golden Tate last month, but he hasn’t made much of an impact and the offense has regressed since he was inserted into the lineup. “We know we’ve got guys that we want to get involved in the game, and the more they’re involved, the better our chances are to win,” offensive coordinator Mike Groh said. A major issue for the offense has been slow starts. The Eagles are scoreless in the first quarter in nine of 11 games. They have only 21 points in the opening quarter, fewest in the NFL. Fourteen of those 21 came in the only game they surpassed 30 points this season. “We have to be better with that,” Wentz said. Notes: RB Darren Sproles returned to practice Thursday in a limited role. He hasn’t played since Week 1 because of a hamstring injury. He returned to the field earlier this month, but re-injured his leg in the first practice. “He’s such a competitor and a leader of this football team, and he wants to be out there, really, really bad,” Pederson said.